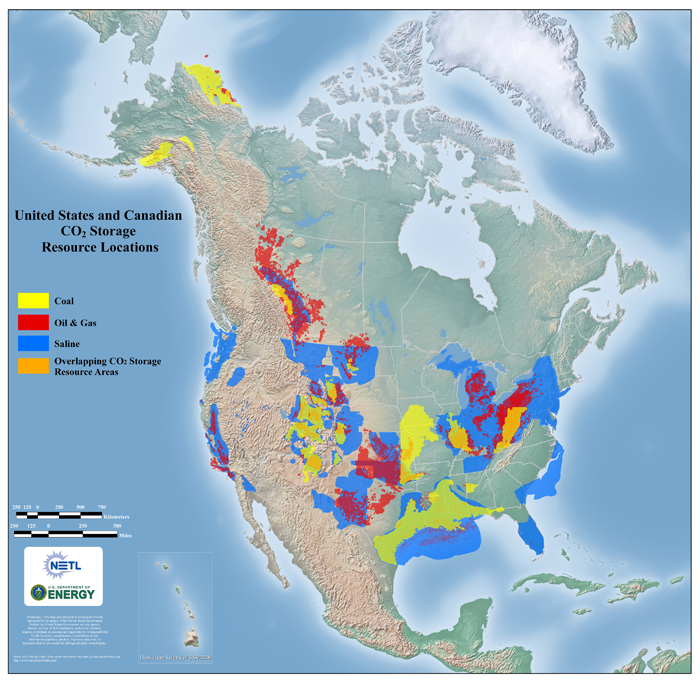 Geological carbon sequestration involves the separation and capture of carbon dioxide (CO2) at the point of emissions followed by storage in deep underground geologic formations. This is also referred to as carbon (or CO2) capture and storage (CCS). Click a link in the lists above to jump to that topic on this page. Physical mechanisms usually involve trapping CO2 within a cavity in the rock underground. These cavities are either large man-made cavities, such as caverns and mines or the pore space present within rock formations such as the structural traps in depleted oil and gas reservoirs and in aquifers. CO2 injection into oil and gas reservoirs is sometimes used to help push out the product and extend the amount of oil and gas that can be recovered from the site. This is called enhanced oil recovery. The United States is the world leader in enhanced oil recovery technology, using about 32 million tons of CO2 per year for this purpose. (2) In this way, there is an economic benefit to CO2 capture and storage for the oil and gas industry. Much of the current work on geological sequestration involves capturing the CO2 from large emitters such as the oil sands and coal-burning electrical plants and injecting the CO2 underground. However, these producers are usually a long distance from suitable geological formations required for potential sequestration sites. So, the CO2 often needs to be piped or trucked from the source to the injection site. This takes a lot of energy which usually involves production of more CO2. How long will the sequestered CO2 remain captured? Are there other consequences or risks that need to be considered? Will this prevent us from reducing our consumption of fossil fuels (esp. coal)? It takes a lot of energy and resources to build and operate sequestration facilities. Is this type of CO2 sequestration cost effective? Wouldn’t we be better to eliminate CO2 production in the first place?